Now is a good time to start cutting the grass a little higher than you had been in the spring. A healthy grass height is 3”, but never less than 2.5”. Keep the mower blades sharpened to prevent the browning of grass tips. Grass can go dormant in extended periods of high temperatures, especially if the lawn is not irrigated. Like shrubs, lawns need the equivalent of 1” of a combination of rainfall and/ or by sprinkler. Put out a rain gauge or a straight-sided glass to measure the amount of water the lawn receives. Try to maintain a regular mowing schedule so you aren’t removing more than 1/3 of the grass blade length. If you do need to cut taller grass, raise your mower to its tallest cutting height. Cut at that height, then lower the mower back to the lower setting and mow a second time. Smaller grass clippings will help prevent clumping. 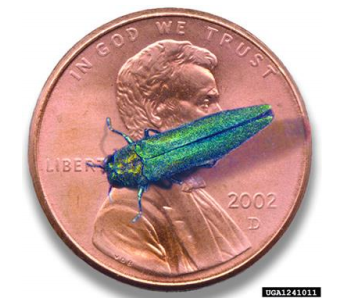 Fall is a great time to have your Ash trees treated for Emerald Ash Borers; EAB. People ask; which Ash trees should they have treated? The only answer to that is; only treat the Ash trees you want to keep. Once EAB invades them, the trees generally last no more than five years. Dead or dying Ash become very brittle, allowing for limbs to break and fall more easily in wind and storms, or from the weight of snow. This can be dangerous to you and your property. It also presents a very real risk to any tree crew that might need to remove the tree. Treating them requires drilling and injecting a specific insecticide at the right amount and at the right time every two years. Contact us for a free quote. Let us take the worry out of it for you. Now is the time to remove spent garden plants and to prepare the soil for fall seeding and planting. Your fall vegetable garden can be a great source of healthy foods.Late August into early September is a good time to sow peas, radishes, leaf lettuces, green beans, spinach, beets and turnips. It’s a good time for a late crop of cabbage, broccoli and kale seedlings. In fact, a frost makes curly kale sweeter. The ground holds its warmth so root vegetables, like beets and turnips, continue to grow. Look for vegetable varieties with a harvest time of 65 days or less. Anything longer and you will likely need to provide a cover when there is an extended cold spell. With just a little care, you could be enjoying fresh vegetables into November, even to Thanksgiving! If you don’t have the space for a full garden, why not try container gardening? 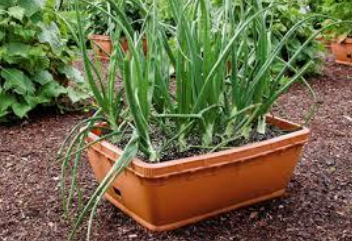 You can grow most any vegetable in a container just as easily as in the ground. A window box is perfect for leaf lettuces, radishes and green onions. Planters are good for the larger plants such as cabbage and kale or even pole beans (green beans). Just provide something for the pole beans to climb. 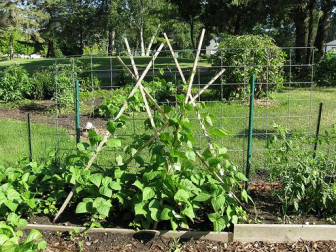 Use three bamboo poles to form a teepee in the container at least five feet high. Sow 2 or 3 seeds at the base of each pole. It won’t be long before you’re enjoying fresh beans. Use this system in containers as well as in the ground.